Correct perception characterizes the state of yoga. We see a situation clearly; we base a decision on our perception; we act on the decision, and things go well. Without correct perception, we have no clarity. A decision is then based upon misunderstanding, and when we act based upon misunderstanding, things do not go well. Suffering then results for us and perhaps others. We saw President Bush make a decision based upon incorrect understanding when invading Iraq in 2003. He based the decision on inaccurate reports that Iraq possessed weapons of mass destruction. The resulting devastation and chaos military action caused much suffering to many people – suffering that continues to this day. How many times in our own lives have we made a decision based upon incorrect understanding? How many times have we correctly understood a situation but failed to act, even though to do so would have been beneficial? Patanjali, author of the Yoga Sutra, identifies the incorrect perception or misapprehension characterizing both of these situations as avidya – the absence of the inner light of knowledge or wisdom. It is the most important of the five klesas or afflictions that cause us suffering. And, it is also the source of the other four klesas. Where does avidya come from? In our lives we develop habits of acting and perception that come from our upbringing, environment, experiences, and culture. The habits of action and perception become deeply rooted so we are often unconscious of them – they are called samskara. Imagine looking through a window onto a city street. 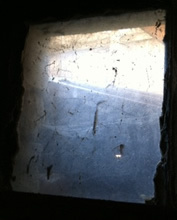 A window so dirty we can’t see clearly what is happening is like our vision when these habits of perception or avidya veil our ability to see clearly. Yet, without the light of awareness we make decisions and take actions based upon our clouded vision. And, if we are not aware of this veil, we continue to make decisions and to act based upon misapprehension and wonder why things are going wrong. Why are we suffering? Bernard Bouanchaud, in his commentary on the Yoga Sutra, explains that the klesas are the causes of “self-induced suffering.” He goes on to say: “The suffering that comes from oneself…is the only cause of suffering on which we can take direct action.” For we cannot eliminate suffering caused by others, and we cannot eliminate suffering caused by natural disasters. By “cleaning” our distorted perceptions from the window through which we view the world, we can reduce our own suffering and the ill-conceived actions that may cause suffering to others. Next week we will continue to examine the next of the klesas – asmita, ego or “I-amness.” In the meantime, become aware of your decisions and why you make them. Notice if you are feel uneasy or unsure as you do make them and act. Consider if you may perceive, decide, and act out of habit. Observe the results of your decisions and actions. Try writing your observations in a journal.